In its December 25, 2015 report, the National Interagency (Fire) Coordination Center released its near year end totals of forest fires and acres burned in the United States. The sobering result is another year above 9 million acres, a total only breached three other years, 2006, 2007 and 2012. It is also just shy of the very troubling 10 million acre mark. Most acres burned in Alaska, a total of 5,146,541 acres or almost 52% of those reported. Compared to the 10 year averages to date, 2015's total of 60,984 fires were far less than the 2005-2014 average of 72,080. However, 2015's 9,937,863 acres consumed are 45% higher than the 2005-2014 average of 6,853,450 acres. This is larger than the states of New Hampshire, Connecticut and Rhode Island combined. If you step back to a decadal scale, the result is even more worrisome. The 2006-2015 YTD total acres burned is 69,729,395 acres, an area larger than Colorado and just shy of Nevada. 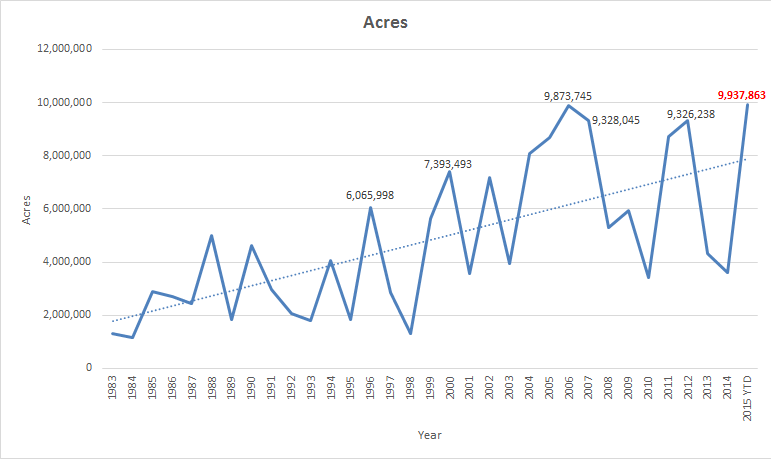 It is also the most acres burned in any prior decade in the US fire record. The trend from 1983 to 2015 depicts a troubling rise in acres burned from about 2 million in 1983 to almost 8 million this year. The data supports the modeled conclusion that the US will experience increasingly fierce and longer fire seasons forecast for the future. Recent modeling reveals that the US may experience a sixfold increase in large forest fires by 2050. If one thinks this is not possible, then it is helpful to recall that the 1983-2015 difference is a 750% increase in fire acreage. Impacts on greenhouse gases and soot are still to be modeled, but when considered in combination with fires and acres burned in Canada, Russia, Brazil, Indonesia and Central Africa, this year's global fires have made a major contribution to the massive increase in atmospheric methane. More on that later. Future Forest Fire Increases: Barbero, R.; Abatzoglou, J.T. ; Larkin, N.K. ; Kolden, C.A. ; Stocks, B. 2015. 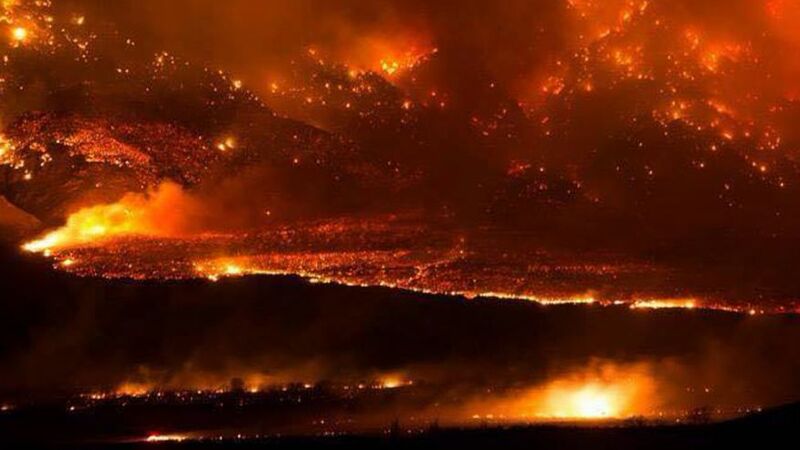 Climate change presents increased potential for very large fires in the contiguous United States. International Journal of Wildland Fire.